The Okavango is, without any doubt, the most widely known area in Botswana. The Delta is an area of tranquil, lily covered lagoons and narrow channels hemmed in by papyrus Reeds, and teeming with animal and bird life. Probably the most precious wetland in the world, The Okavango is a river delta that feeds into dry land instead of the sea. It is the only one of its kind.The Okavango Delta is a unique oasis at the northern edge of the sands of the Kalahari Desert. Flood rainwaters from the Angolan highlands are carried by the Okavango River into the delta where it spreads out creating countless waterways and lagoons over an area of approximately 10 000 square km. Papyrus and Phoenix palms flourish here on the edge of the desert, and the waters provide an ecosystem for Fish Eagles and Kingfishers, Hippopotami, Crocodiles and Tiger fish.During the peak of the flooding, the deltas area can expand to over 16,000 square km, shrinking to less than 9,000 square km in the low period. As the water travels through the delta, the wildlife starts to move back into the region. 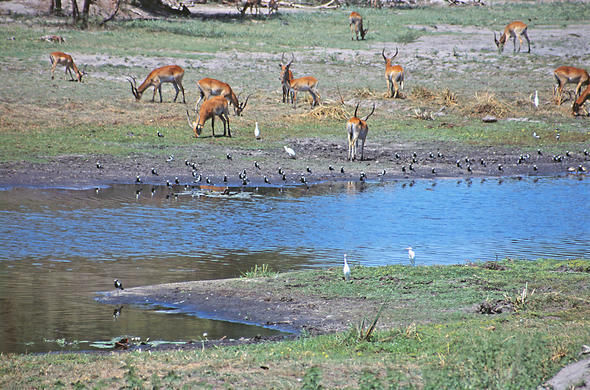 The areas surrounding the delta are beginning to dry out (the rains in Botswana occur approximately the same time as in Angola) and the wildlife starts to congregate on the edge of the newly flooded areas, May through October. The best time to visit this beautiful area is from May through to October, when the Okavango River floods the delta. December to February is the wet season and is not recommended.The best time for game viewing in the delta is during the May-October period, as the animal life is concentrated along the flooded areas and the vegetation has dried out. Birding and vegetation is wonderful to experience during the rainy season (Nov - April) as the migrant bird populations are returning and the plants are flowering and green. The Delta offers unparalleled opportunities for bird watching, game viewing, fishing, photography, night drives and walking safaris. The Delta is most famous for its bird life, which includes more than 350 species. Eagles, Pel's Fishing Owls and Bee-eaters can be seen on a game- viewing trip, on a traditional dug-out canoe. Millions of years ago the Okavango River use to flow into a large inland lake called Lake Makgadikgadi (now Makgadikgadi Pans). Tectonic activity and faulting interrupted the flow of the river causing it to backup and form what is now the Okavango delta. This has created a unique system of waterways that now supports a vast array of animal and plant life that would have otherwise been a dry Kalahari savanna.The deltas floods are fed from the Angolan rains, which start in October and finish sometime in April. The floods only cross the border between Botswana and Namibia in December and will only reach the bottom end of the delta (Maun) sometime in July, taking almost nine months from the source to the bottom.This slow meandering pace of the flood is due to the lack of drop in elevation, which drops a little more than 60m over a distance of 450km. The deltas water deadends in the Kalahari, via the Botetle River, with over 95 per cent of the water eventually evaporating. The 3 habitats provide a variety of accommodation options, which range from the most primitive safari camps, to luxury lodges and camps. Excellent game views can be enjoyed over the river, of Elephant, Lion, Leopard, and Buffalo herds. Generally it is possible to do this from the sun deck of your riverside lodge. At night, the air is alive with the sound of millions of Frogs - a glorious cacophony, a magnificent symphony to lull the traveler to sleep. In the distance the roar of Lion or nervous giggle of Hyena pierce the senses and the soul. This is Africa at her untamed best.The myriads of islands that dot the Okavango Delta's water are mostimpressive in August when the water is at its deepest. While most of the young animal and bird species are born between November and March when the vegetation is lush.Okavango Delta wilderness and river safaris are for those with an appetite for the ultimate adventure with journeys away from the maddening crowds into some of Africa's best game parks. The routes follow ancient animal migration trails with a potential surprise around each bend, turning the safari into a truly life-altering experience. Access to the heart of the delta is by air, usually from Maun only, making it an exclusive destination, thus it is relatively unpopulated and wild.